Sporty impression gained from the use of 3D Design Grille, HID projector headlights are slightly slanted, a line that ran from the front to the rear of the car, as well as an aggressive rear combination lamps LED technology. All-New Teana carries mechanical heart QR25DE 2.5-liter Twin CVTC with X-TRONIC automatic transmission CVT. 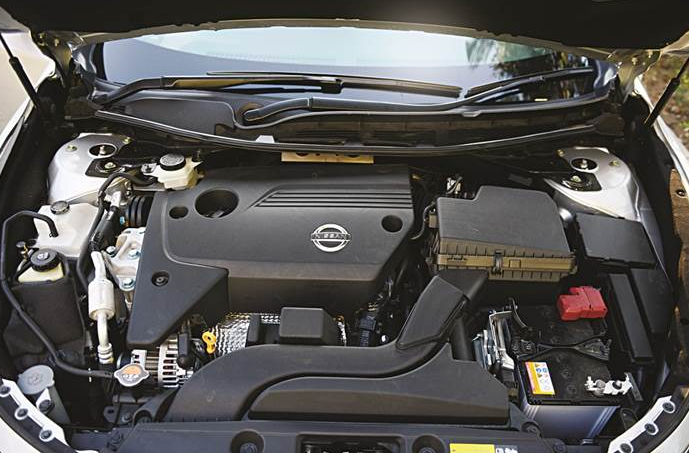 The use of configuration 4-cylinder engine that replaces the engine 'V' on the previous Teana impact on smaller power 10 hp than the previous version. However, peak torque increased to 234 Nm is achieved at lower engine lap. The use of technology on the entire Zero Gravity Seat bench, claimed the NMI is able to make the sitting position is actually right to bear the whole body. Plus the use of supported audio system Bose nine-speaker Premium Audio System, boosting the comfort of the cabin. Welcome Seat features ease of access in and out of the driver's seat, electric seat Teana also features two memory settings to store position bench. Steering wheel 3-spoke leather-covered buttons have imbued the audio and cruise control functions. 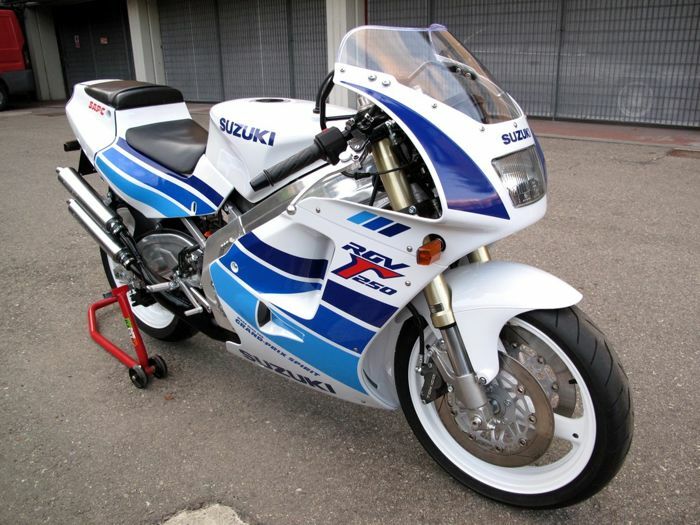 The difference in the character of the front and rear suspension can be felt clearly. When I was in the backseat, the characters felt soft suspension absorbs the impact, but when you are behind the wheel, suspension damping it feels solid, but not up to the level of hard, have harder spring rate on the front, which is intended to support performance driving better side ". While on the bonnet, right behind the headlights there are grooves that is claimed to increase the value of aerodynamics. surge of torque from the new engine feels so solid. Loaded four-passenger, all-new Teana acceleration is very unreliable to precede the vehicle in front, but if faced with the uphill road conditions, you should slide the gear lever to the position of 'Ds'. Transmission X-TRONIC CVT transmission intelligently adjusts to playing in a lower gear ratio to maintain the abundant torque. Faced with winding streets, control of the All-New Teana feels solid. Wheel weights fitted, not too light thanks to the use of Electronic Hydraulic Power Steering (HEPS). Maneuvered Currently, there are no symptoms typical understeer front drive car. 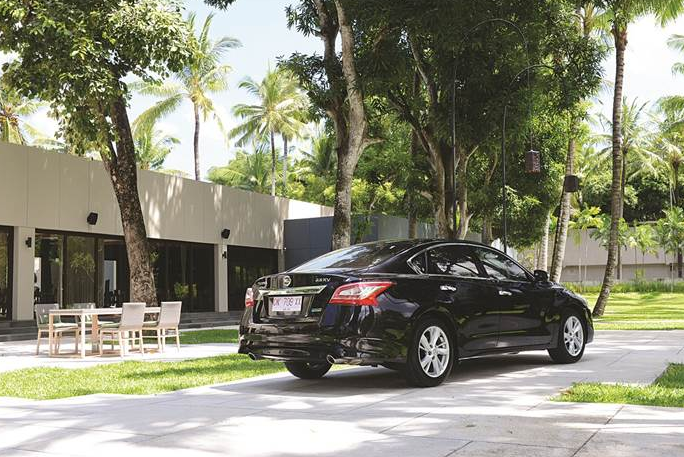 The lack of understeer on the All-New Nissan Teana is thanks to the use of technology, Active Understeer Control. Maneuver sharp corners can be addressed properly due to the use of the Active Trace Control, which automatically activates the brakes during cornering, this function is similar to the technology Limited Slip Differential (LSD), which limits the power to the wheel that is getting little traction. While sitting on the bench next to the driver, be a good time to explore features in the cabin more. The dashboard design has a modern and luxurious nuance with a bandage wood panels at some point the dashboard, door trim and 'piano finish' on the center console. The use of 'piano finish' on the center console enough to give the impression of luxury, but it makes it easy to dirty with fingerprint smudges, use a cream color on the ceiling is also likely to make a quick dirty. Quite scattered luggage compartment in the front cabin, the doors, the dashboard and center armrest. At the center armrest there is also a 'secret room' to store valuables. There are cup holders in all doors and front and rear armrest also. 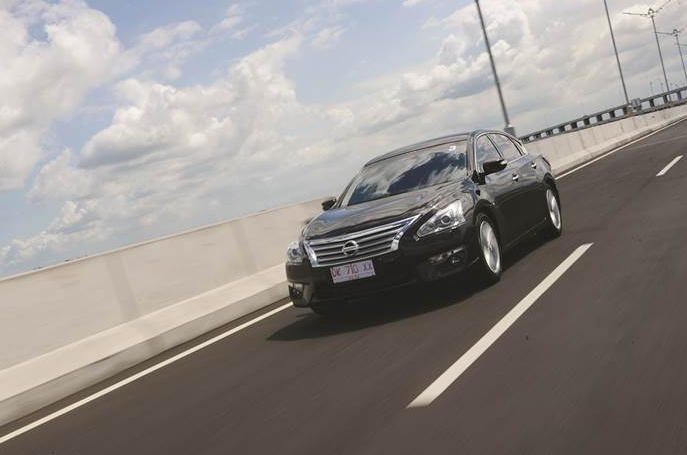 Sunroof became standard all-new Teana which made ​​our trip feel more classy. The screen size of 5 inches head unit feels quite intuitive, though not a touch screen. Dial button to change radio channels and tracks, are easy to reach from the driver's side. 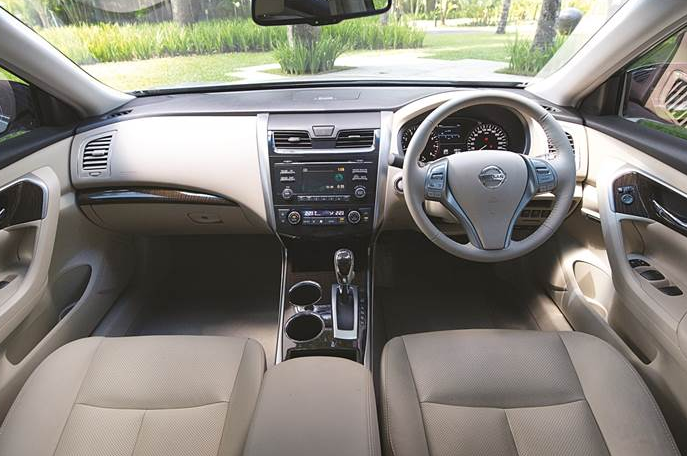 Cabin of All-New Nissan Teana also feels quite good. Road noise, engine noise, and the wind was minimal penetrate into the cabin. to achieve all this, the NMI sprinkle All-New Teana with various cancellation technology, among other forms of exhaust mounting, engine mounting materials, glass shape, sound insulation, carpet and even the basic all-new Teana which uses a special coating to make a beautiful impression in the cabin. This car feels complete as you can get a special comfort in the back seat at the same steady control when behind the wheel. If you the owner of the Nissan Teana previously tended to sit in the back and use the driver, the all-new Teana occasionally you need to drive by yourself because it is so fun.